"Get your spine tingled and your blood curdled with all-new, all-true, very scary stories!" Scary True is horror micro-fiction framed as paranormal encounters with monsters, ghosts, UFOs, and other scary stuff. 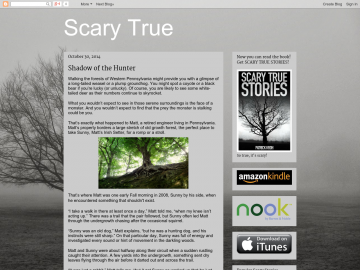 Scary True is a fictional version of paranormal websites where strange sightings are reported. Scary True is a series of stories wherein characters relate their scary experience to the blog's author, who goes by the name Scared. Some characters return (like the 1960s cops, The Midnighters) and some themes are and will be developed further (like the monster children of Mother Meade), but the stories are mostly very short, very strange, pretty scary vignettes. Scary True has not been reviewed yet. Scary True has not been recommended yet.